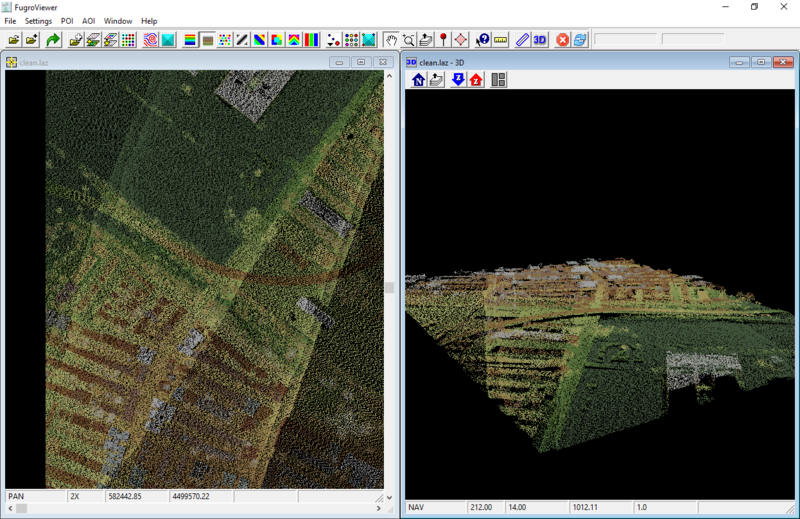 This exercise uses PDAL to remove unwanted noise in an airborne LiDAR collection. PDAL provides the outlier filter to apply a statistical filter to data. This pipeline is available in your workshop materials in the ./exercises/analysis/denoising/denoise.json file. The PDAL outlier filter does most of the work for this operation. At this point, the outliers have been classified per the LAS specification as low/noise points with a classification value of 7. The range filter can remove these noise points by constructing a range with the value Classification! [7:7], which passes every point with a Classification value not equal to 7. Even with the filters.outlier operation, there is still a cluster of points with extremely negative Z values. These are some artifact or miscomputation of processing, and we don’t want these points. We can construct another range to keep only points that are within the range \(-100 <= Z <= 3000\). Both ranges are passed as a comma-separated list to the range filter via the limits option. Control the aggressiveness of the algorithm with the mean_k parameter. filters.outlier requires the entire set in memory to process. If you have really large files, you are going to need to split them in some way.